EFLC Certification Program Enrollment is now open for the 2019-2020 Program. Class size is limited to ensure deep learning and hands on healing for all learning segments. Three spots remaining for the next program. Apply today to be invited into this program. Location Program locations are in Colorado, California and Arizona. This program is part of the yearlong EFLC Certification Program. To attend you must be accepted into the program which starts early 2019. Click Here to receive a complete information packet about the EFLC Certification Program. Contact/ Tuition Click here to email us for a document with all information regarding the EFLC Certification Program. 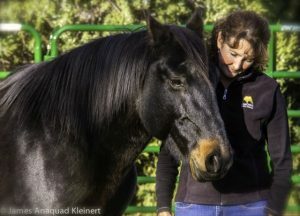 This is a three-day deeply transformational Equine Facilitated Learning program facilitated by author and teacher Kathy Pike. Includes program materials, individual sessions and snacks. Bring a bag lunch. Click Here for program description. Kathy will guide you to higher levels of consciousness through concepts such as the Law of Attraction, quantum physics, sound therapy, the chakra system, meditation, the emerging field of epigenetics, and creative visualization. Tuition for this 4-day program includes extensive handouts, all exercises and lectures, as well as one-on-one time with Kathy and her masterful herd. Program has limited space. 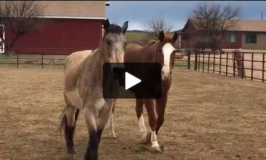 Equine Facilitated Learning and Coaching (EFLC) Level One – Only Two Spots Left! This program includes the three-day Dance of Authenticity through the Wisdom of Horse workshop (listed above), followed by one day off, then the four-day EFLC Level One facilitator training. The EFLC Level One is the first step into the Full Certification program. You may also take this program without being in the Full Certification Program. Tuition includes an in-depth EFLC Level One training manual and hands on time learning with horses. Limited space to ensure individual attention. This is a hands on, non-riding program. Kathy Pike will be present for portions of this program to enhance your learning and share her stories of working with horses. The training portion is primarily taught by ACWH Advanced Facilitator and Level One Provider, Jackie Hibbard. This program includes the three-day Dance of Authenticity through the Wisdom of Horse workshop, followed by one day off, then the four-day EFLC Level One facilitator training. The EFLC Level One is the first step into the Full Certification program. You may also take this program without being in the Full Certification Program. Tuition includes an in-depth EFLC Level One training manual and hands on time learning with horses. Limited space to ensure individual attention. This is a hands on, non-riding program. Facilitated by ACWH Advanced Facilitator and Level One Provider, Anouk Lorie. This is a hands on, non-riding workshop, no experience needed. It includes information packet with worksheets, individual sessions with the horses and snacks. Click Here for full description. This program is required to continue on to the EFLC Level One Training program but can also be taken on its own. Facilitated by ACWH Advanced Facilitator and Level One Provider,Anouk Lorie. Evening lecture and talk with author and teacher Kathy Pike followed by reflective time with the horses. All individuals wishing to attend the Thursday Evening Lecture will pay at the door and all proceeds go to the non-profit HeartSpace Sanctuary. Explore a heart opening with horses during this full-day event with author and teacher Kathy Pike. Deepen into the teaching of horse through demonstrations and group activities with the horses. Portions of proceeds go to the horses at the Sanctuary. Bring a bag lunch. Limited space, reserve your spot in advance. Location Moon Dance Ranch, Arroyo Grande, California (fly into San Luis Obispo). We are always adding to our Calendar as new opportunities arise so please check back for new dates throughout the year. Also, be sure to sign up for our Newsletter so that you will be the first to know when new programs are announced. If you prefer to do a bank transfer please email for bank transfer information. For additional program information, email Support. "Thank you for all of your efforts in putting on such a program. It could not have come at a better time. I am transformed. I shall strive to never live in a small manner again. Living that way does not serve any purpose. I have come out of it a leader among horses with their respect and shall translate this over to my human encounters." "The growth I have experienced from working with Kathy and the chakra system has been so huge and incredible it is very difficult to sum it up in a few words. I have experienced a tremendous increase in the balance and integration of my own energy. I feel like I 'know myself' in a deeper, more intimate way which has resulted in greater happiness and joy in my life and vastly improved relationships with family and others." Traveling too much for you right now? 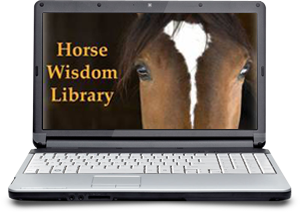 Unlimited Access to the Horse Wisdom Library brings the EFLC work directly to you. Click Here to learn more. "Kathy Pike has the ability to know exactly what to say, when to listen and when to question. She knows just how to get me to look a little deeper and has the right exercises to keep me focused. She has a wonderful balance of gentleness and directness that has allowed me to feel fully supported and challenged at the same time. Kathy has been extremely attentive and focused on my needs. There is now doubt about it, some of the calls are tough. Tough in a way that feels successful, as you have stretched further than you thought possible. I realize that to develop, it is in those moments of discovery that will help lead me to where I ultimately want to be. If you are ready to do the work, work with Kathy. She will be there to push you, listen to you, support you and praise you as you continue to grow." "Fellow EFLC graduate Carole Rodon joined me for our first three-day equine program at the Skyland Camp for Girls. Everyone was blown away by the weekend sessions. It was simply magical. The herd has clearly been ready for this work and communicated in ways that even the most experienced Skyland horsewomen have never seen. The weekend was simply beautiful. Thank you, Kathy, for your part in getting this work into the world. You're on my mind and in my heart as we move forward with EFLC at Skyland Camp.